Today I traveled from Amman to Tel Aviv. The 69 mile journey took a total of 5.5 hours, and that was probably record time. I woke up today in Amman at 5:30. I took a taxi from downtown for 1JD to Abdali Jett station, which is more of an office. Here I bought a ticket for King Huessaen Bridge for 7.5JD. King Huessaen Bridge (Jordan side) or Allepy Bridge (palastinian) side is the most difficult boarder between Jordan and Israel, due to it being the only boarder that Palastinian Citizens can cross to Jordan. 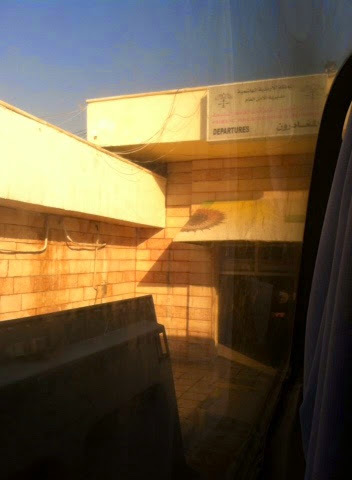 The one hour bus ride from Amman went smoothly, the bus was almost empty as it pulled into the Departing side of Jordan border. Here you fill out a basic paper with name, nationality, and passport number. You then stand in line for a stamp and to pay the exit fee of 10JD. They then take your passport and direct you to the bus that will cross the boarder to the West Bank. The bus is 7JD for yourself and 1.5JD for any big bags. You load onto the bus and receive your passport. You then start across no-mans land where photography is not allowed. 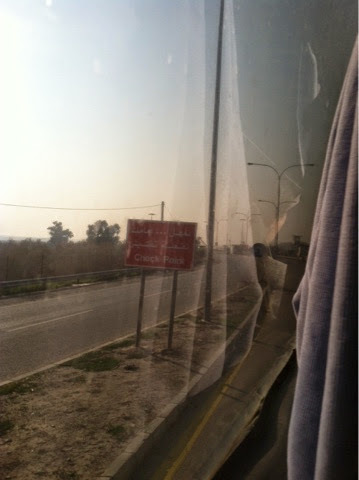 After a few check points you reach the israel side. This where things start to slow down. First you check your bag, this you don't get back until the end. Next is passport control where you are asked a couple questions and then ushered into a security check. If you have been to Israel before then you know how common it is to see people walking around with machine guns, as if it were a purse. Some undercover soldiers even wear civilian clothes, which can be a bit odd at first, since it's aperrent from the huge gun around their shoulder that they are not civilian. My Israeli friend said while in the army, weapon handling is a very important topic, so don't worry too much. The boarder is teaming with these undercover soldiers. Since I look like trouble my passport was taken and I was asked to wait for a couple minutes. They asked for my phone and wallet, which they wiped to check for chemicals. I was cleared after a couple minutes and headed to the interrogation line. 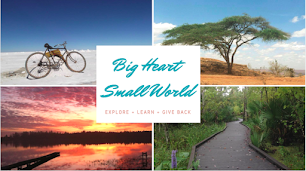 As the couple in front of me was grilled about their itinerary, purpose of travel, jobs, number of kids, type of dogs they have and their favorite colors I began to dred my own interrogation. I stepped up to the counter, where the very serious Israeli officer began asking me similar questions. I handed over my friends contact info from Haifa and he seemed happy with my answers. He handed over a new Israeli visa and sent me on my way. I found my backpack lying among a pile of other luggage. I picked it up and left the building. Outside buses, taxis and shuttles awaited travelers. I heard a guy yelling "Jerusalem" and headed toward the noise. I bought a 42NIS ticket for me and a 5NIS for my bag for a shared van to Jerusalem, Demascus Gate. I waited 30 minutes for the van to fill up. The ride was 1 hour and dropped me a block from Demascus gate. 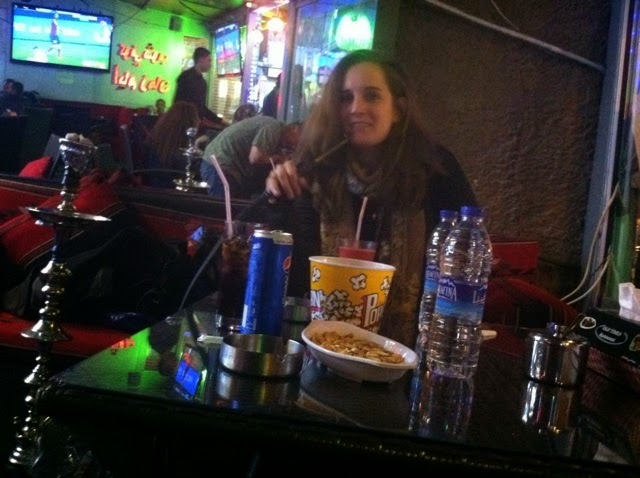 I walked toward the Arab bus station hoping I could find something to Tel Aviv. A guy was yelling Tel Aviv, I asked how much, he said 30 Shekles but i negotiated it down to 25. I picked up a shawarma from a local Palastinian shop and waited for the shuttle to fill up with people. It took 1 hour to get to Tel Aviv. I met two British guys on the bus who were nice enough to let me put my backpack in the hostel room. We then took off for a long walk along the beach. 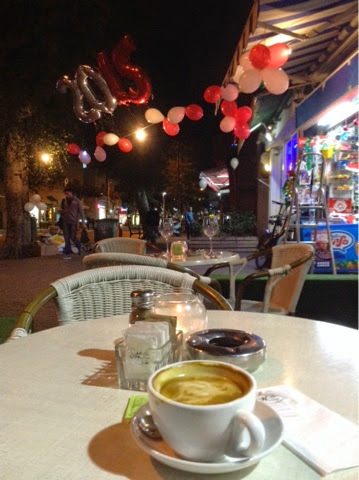 I am now sitting drinking a cup of coffee and waiting for my friend Shimrit to celebrate the new year Tel Aviv style. Sounds like you are off to an excellent adventure! Can't wait to read about where your journey takes you! Enjoy!